Brand new, high quality construction in Town, featuring three floors of living space. Five bedrooms each with an en-suite bath plus two powder rooms. Gourmet kitchen with top of the line appliances, Ship-lap accent walls, gorgeous tile, Kohler fixtures, finished lower level with family room and great kids room with built in bunks, patio area with beautiful stone work are just some of the amenities that round out this lovely home. 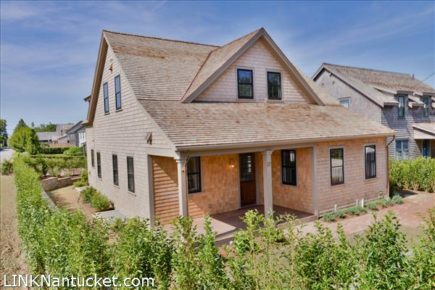 This is a beautiful property within close proximity to Town, easy access to the south shore beaches as well as the Cliff and Brant Point areas. The Cisco and Madaket bike paths are a short distance away. This would make a fabulous home for a family or a fantastic rental property. Lower Level Spacious recreation/entertainment area, Large bedroom with two built in bunks (twins over full beds), full bath with double sinks and shower stall, powder room, owners storage closet, and utility room. Close your eyes and imagine yourself in a private garden set back from the street in the old historic district. ..
Just off of Main Street at the corner of Martins Lane, this Beautiful Antique home was extensively renovated in 2002. ..